The opening of the Somerset and Dorset railway northern extension to Bath in 1874 allowed through trains to travel over the Great Western and Midland Railway between the Midlands, the north of England and Bournemouth. The forerunner of what became the "Pines Express" was a Manchester to Bournemouth restaurant car train started running on weekdays in October 1910 which was unofficially known as the “The Dinner”. Like many named expresses it stopped running during First World War but was reinstated by 1922. The train included through carriages from Bournemouth West and Swanage to Liverpool and Manchester. The 248 mile journey from Bournemouth to Manchester took around 6 hours 25 minutes. Running via Birmingham New Street, the Lickey incline, Gloucester Eastgate, Mangotsfield and Bath Green Park the train was given the name "Pines Express" in 1927 and it ran until the outbreak of the Second World War in September 1939. The express took its name from a number of Pine Trees at the Bournemouth end of the line. The "Pines" was restored in 1949 and included a Sheffield portion. However the journey time of 7 hours and 7 minutes by 1958 hardly meant it was an express - in was significantly slower than the same journey 36 years before. The virtual takeover if the Somerset and Dorset railway by the Western Region in 1958 spelt the end for through workings over the line and the last pines over the route ran on 6 September 1962 appropriately hauled single-handed by BR Standard class 9F 2-10-0 92220 Evening Star. After that date the train was rerouted via Oxford and Basingstoke. The last ever Pines Express ran via this new route was 4 March 1967. After the Second World War the "Pines" was normally hauled by "Jubilee" or "Black Five" 4-6-0s between Manchester and Green Park. These were replaced by BR Sulzer Type 4s in the early 1960s but the route south of Bath Green Park was always very different. 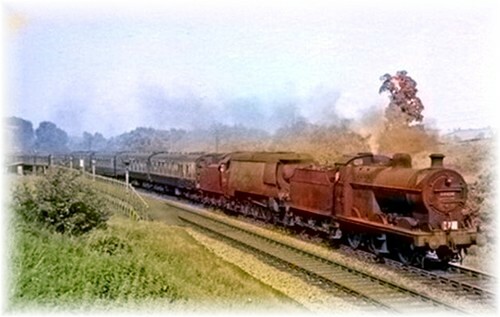 The steeply graded line over the Mendips necessitated double heading of the train until the introduction of BR Standard Class 9F 2-10-0s in the 1960s. Locomotive combinations on summer Saturday were unique anywhere on BR pairing of ex LMS Class 2P 4-4-0s, S&DJR Class 7F 2-8-0s, Stanier Black 5s, Southern Region "West Country" and "Battle of Britain" 4-6-2s, Johnson 3F 0-6-0, Fowler 4F 0-6-0s and BR Standard Class 5MT 4-6-0s were a common sight between Bath Green Park and Evercreech Junction. While the Class 9Fs were the first locomotives able to haul heavy passenger trains over the Mendips without assistance their arrival on the scene came too late to save the line from closure. The Pines Express has a connection with Redditch. The normal route was via the Lickey Incline via Bromsgrove but on a number of occasions the express was diverted via the rail line through Redditch due to engineering works.